When you’re looking at art, is the experience all in your head? Thoughts, memories, questions and analysis are often associated with the mind rather than the body. However, the experience of standing in front of a painting has a unique way of reminding us that the body and mind are not separate. Nationale may be a small place, but it has something for all the senses. When you first walk in, Marseille soaps and Olo fragrances offer a gentle scented welcome. 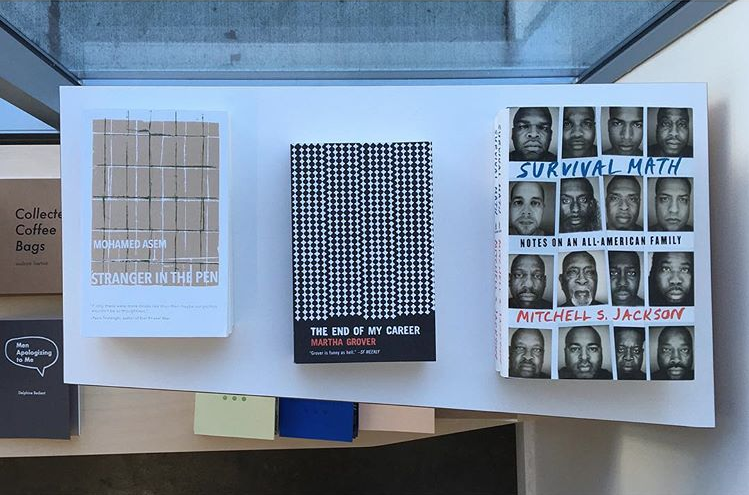 Most people navigate the gallery counterclockwise, and the first thing they want to do in Nationale is flip through some of our books. The activity of flipping through books is a sensory treat for the hands, allowing us to touch and physically play with information as we read it. Plus, books make really nice sounds if you’ll listen. Even if you bring a friend to Nationale who doesn’t like socially relevant poetry, fiction and essays, they can enjoy the sound of paper’s friction. This month, we’ve been exhibiting Soft Shades by Lilian Martinez. In addition to the show’s ideological and formal strengths, it is a visceral delight. 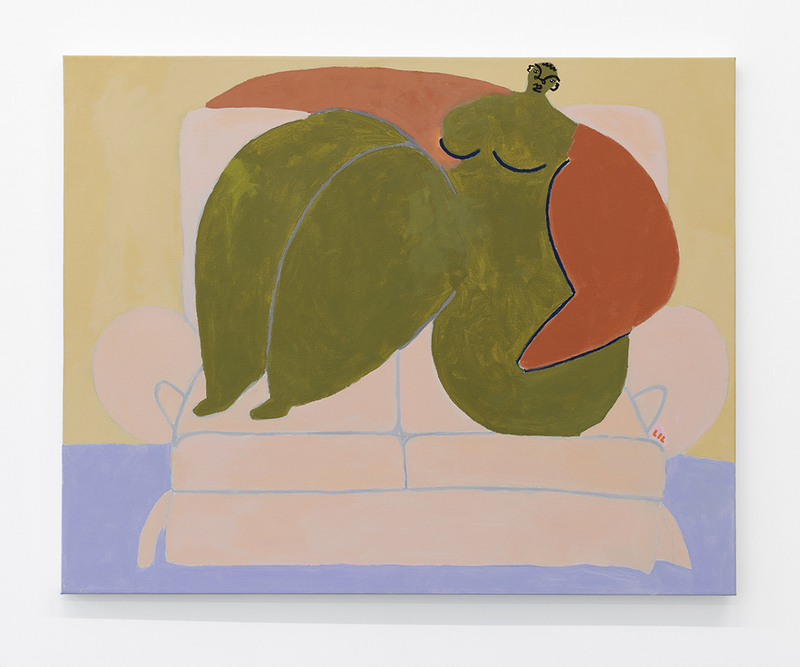 The paintings’ sunny pastel colors are delicious, transporting us like a weekend getaway to LA, where Martinez resides. Something about her style of painting sends ASMR-style tingles down my back. The soft, luxurious texture of her acrylic on linen is amplified by large, blocky color fields and harmonious compositions. Delicately painted lines and the intimate, reverent depiction of strong women at rest induce a physical sensation of ease. In a weird way, the experience of looking at these paintings feels like having my hair brushed by my mother or friend. Did you have this type of experience with Soft Shades, too? If you haven’t been able to see the exhibition it will be up one more day: through March 11. In the hallway near Martinez’s paintings, there are stacks of woven blankets and pillows from her line of everyday objects, BFGF. Due to the variety of blankets, we get to unfold them one at a time to see what’s inside, then refold. They bring out the softness in her paintings and transform it into something you can snuggle. To conclude a sensory tour of Nationale, you can find two kinds of French lozenge candies at the desk. “Sève de Pin” and “Anise” may be unfamiliar flavors, but don’t worry. They are both delicious! If you work in an environment that requires a lot of brain power, it can be easy to forget about the five senses. Especially during winter, it sometimes feels like the mind and body are two separate entities. As our clocks turn forward and the sun comes out, now is a great time to bring them back together. So come see us at Nationale! We even have floor-to-ceiling windows, for maximum sunshine and minimum pre-spring chills. Curiosity lives in the artist, who walks through life asking questions. The artist cultivates sensitivity and patience, turning curiosity into projects. A gallery presents the projects of artists, for anyone who is willing to come spend some time with the art. What happens next? The art lives in those who have considered it, and enriches their curiosity as they walk through life. 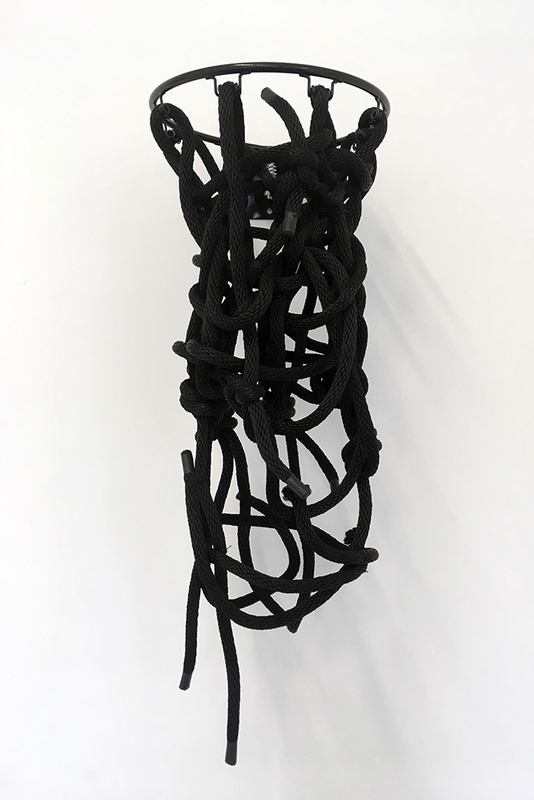 Kate Towers brings curiosity full circle in her current show Hoops, a pop-up at Nationale. What used to be basketball hoops are now explosive woven sculptures. Wild combinations of fabric, cords, synthetic plants, yarn, and natural materials transform a commonly overlooked public fixture into something new. Each hoop puts a unique spin on Towers' concept and materials. Glucose, with its fluorescent yellow and pink knit body, entices viewers' playful inner child. It appears next to Paleo, whose aesthetic is more somber: a single black cord tangled up in itself. Both are deliberate yet expressive. Glucose has a looser body, while Paleo's stiffness resists gravity. Collagen Peptide, with a refined color palette and seductive textural details, speaks to Towers' background as a fashion designer. Her clothing sometimes incorporates elements of sportswear into modern, flowy garments. In her fashion design as well as hoop design, traditionally feminine aesthetics play with rougher athletic vibes. She seems to question the expectations of three worlds: fashion, sport and art. Two hoops, Plant Based and Gluten Free weave plant shapes for a more organic vibe. Speaking of organic, did Towers use food and diet-related titles to fortify the corporeal connection between art, sport and fashion? Either way, this body of work is inspiring. It feeds our imagination and invites us to see new possibilities in everyday fixtures. Towers reconsiders something we may normally pass without seeing: the iconic metal rim. She honors creativity in its purest form. She explores a wide variety of materials, abstractly and conceptually, while carefully honoring the desires of each material. Hoops has been extended to January 29, so if you haven't made it in yet, now's your chance! The work photographs well, but it's a slam dunk IRL. Kate Towers' HOOPS pop-up extended! 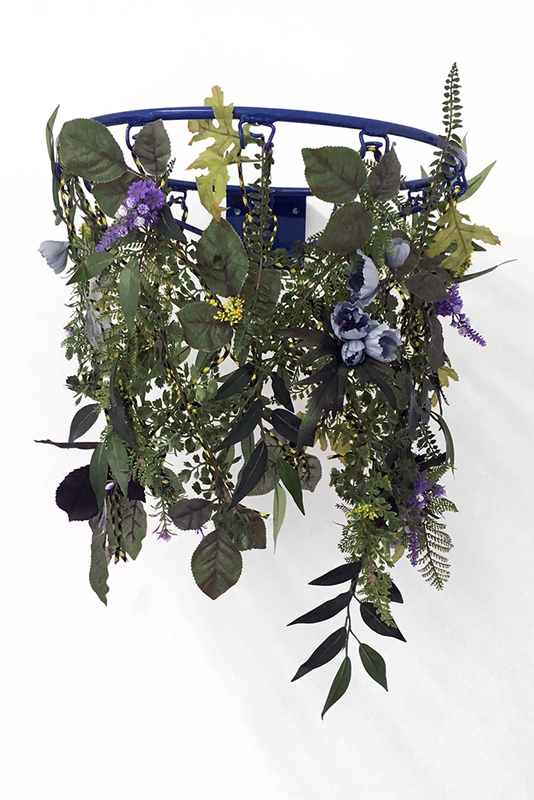 Nationale welcomes 2019 with HOOPS, a pop up from designer & artist Kate Towers. 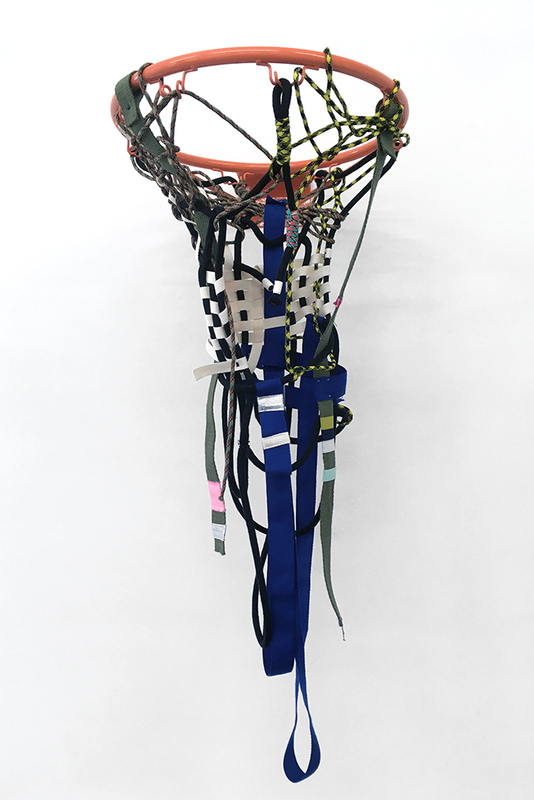 With her series of sculptural (and lightly functional) indoor basketball hoops, Towers uniquely merges sport, art, and fashion. 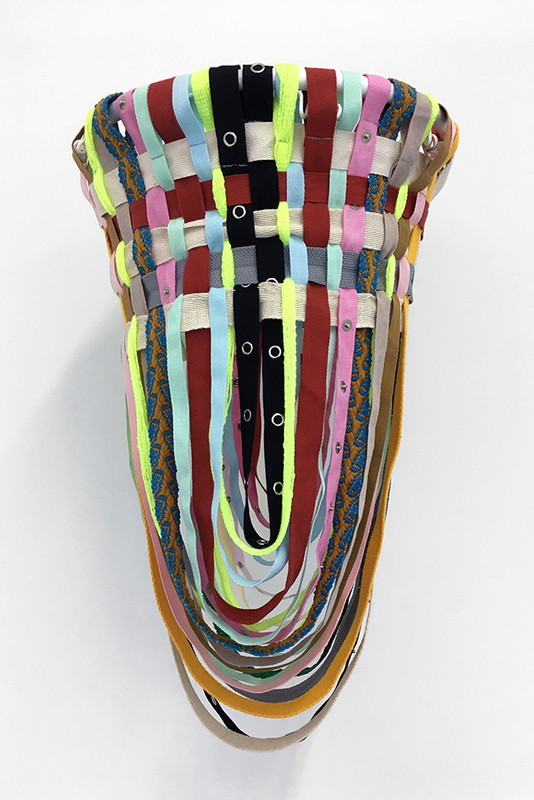 Woven and sewn from myriad materials including ropes, textile scraps, paper, and dried reeds, these hoops have an intentionally haphazard and eclectic vibe. They are an extension of Towers’ clothing designs; indeed, she has been experimenting with sport and fashion for years, often sewing athletic stripes down the sides of her garments, and gleaning inspiration from the aesthetics of sports culture. Kate Towers is a Portland-based clothing designer. Self-taught through experimentation, an artist vision, and hands-on execution, her non-seasonal, one-of-a-kind pieces often borrow inspiration from nature, team sports, motherhood, and various themes of life. 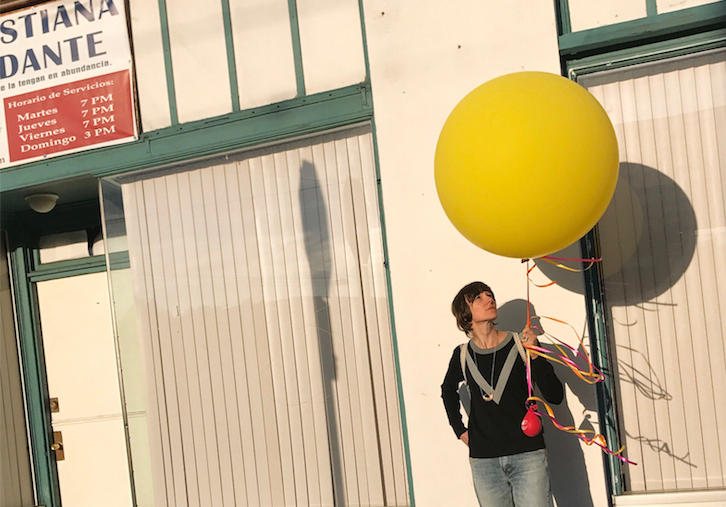 From 2000 to 2008, Towers was co-founder and co-owner of Seaplane, a renowned specialty shop in Portland featuring local designers and an innovative collection of hand-made clothing. It is there that Towers developed her own line and helped inspire the fashion scene that is now Portland. When we are young, the world appears full of magic. We are the center of our universe- we know of little beyond our guided travels. Time equals now. The past is a vague sentiment alluded to in passing by patronizing adults. Of course, how could we fully grasp our place within history having only been a part of it for such a small time? As we age though, this credulity towards the significance of our present yellows and fades. The once glorified landmarks of our hometown no longer hold the same power. Knowledge broadens our scope and awakens our anxieties, ultimately rousing nostalgia for the innocence and the simplicity of what once appeared to be. 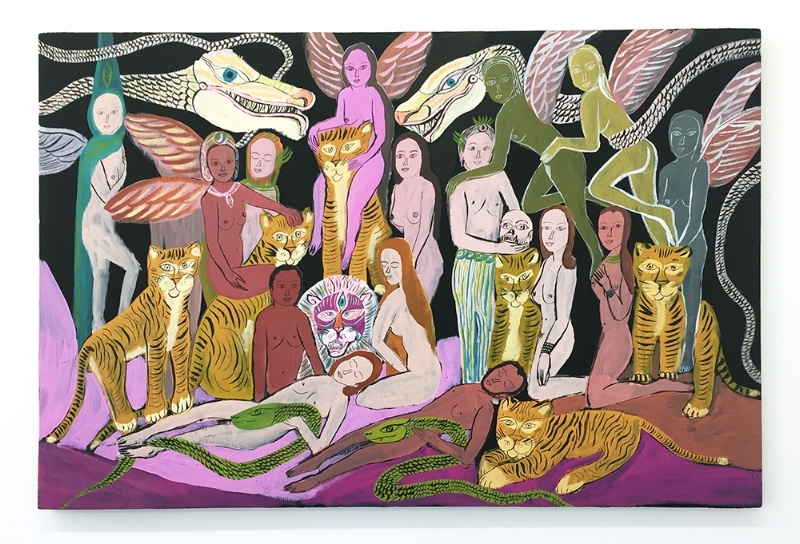 The paintings of Portland-based artist Ty Ennis on view for his solo exhibition The Marble Fountain at Nationale exist within this reflective tendency. Scenes culled from his recent memory are presented alongside a medley of melancholic dreams, holiday lore, and subtle references to aesthetic predecessors. In this manner, the various facts of Ennis’ biography unravel into a loose interpretation of what once was. Unable to replicate the naive enchantment of his youth, Ennis’ work instead focuses on the indeterminacy of aging—the space between then and now, them and us, here and there. There is a pervasive feeling of looking in. We are rarely situated within the canvas but remain slightly disconnected by borders like a window or even a faint green frame. In Cinéma (Paris) and Cinéma No. 2, for example, Ennis recreates a simple scene that he encountered during a recent trip to France. Instead of freezing the moment’s objective particulars through a photograph, Ennis attempts to capture its aura, its subjective allure, through two paintings based solely on his now-faded recollection of the encounter. Perhaps mirroring this distance between the time of the scene’s occurrence and his painting of it, the work exudes a feeling of haziness. From across a pathway of hoary brushstrokes and through the outlines of a building’s façade, we glimpse the fuzzy silhouettes of two women at a local cinema. This physical remove, however, allows us little else in terms of interpretation. From such a distance, we remain lost in the unknown—do the two figures recognize one another’s presence? Are they friends conversing or separate individuals lost within their own quotidian reveries? We, as outsiders, can only speculate. Analogous to this specific utilization of space, Ennis’ scenes often depict only the aftereffects of an action. In And so It Goes, he depicts two large, white pills left next to a half-empty glass of water and an overstuffed pink ashtray on a small table. A chair pushed away from the table suggests someone having recently gotten up. Outside of these minute indicators, there is nothing else within the frame for us to decipher. A window, for example, looks out only onto an opaque mass of white paint and the surrounding walls appear, meanwhile, like a void of a shadowy grey brushstrokes. Yet, despite this minimalism, the scene effectively evokes a familiar, forlorn impression of departure. Ennis seems to suggest that, like memories, the particulars matter less than the overall sensation. In Yur’s, a man stands with one hand resting on a jukebox. His pose suggests that of someone waiting for their photo to be taken, thereby echoing the painted portrait that hangs by his head on a nearby wall. Through this visual parallel, Ennis evokes a larger conception of lineage—of the shift in time from ancestor to predecessor, from painting to photography, from fact to fiction. Ennis further encourages this historicizing process throughout the exhibition by both his frequent use of a black and white palette and his loose painterly style. Viewed together in this manner, Ennis’ work, like adulthood, lacks a fixed center. It is nothing but an entropic, yet, deep down, still unbelievably magical force. This commissioned essay is made possible by Career Opportunity Grants from both the Oregon Arts Commission and The Ford Family Foundation. Creative writing on Ty Ennis' solo exhibition, "The Marble Fountain"
A painter sits at his desk, quietly gazing into a candle's flame. Between working full-time and raising a daughter, it's rare to arrive at such a moment of solitude. Memories come back, from his younger days in a small town. He remembers mischievous schoolboys, pressuring him to be more masculine. He remembers a monologue in someone's living room. A face... an expression... The memories are not formatted; some of them are missing pieces. Faces fade into one another. Occasionally the straight vertical line of a nose will almost return the artist to his seat at the desk, in front of that long, straight candle. Time continues to pass. With his current show at Nationale, The Marble Fountain, Ty Ennis invites viewers into formative memories and dreams. Many of his paintings contain a quiet sense of horror, amplified by a lack of color. Above any one narrative, they express something specific to paint: the way textures communicate on a flat canvas. From aggressive and thick to diluted and watery, Ennis explores the possibilities of combination freely. A fuzzy quality unites the medium with its content. In Orlando, the largest painting on display, an androgynous bride gazes out, far into the distance. Around the back corner of the gallery, one scene is repeated in two paintings: a mysterious observation of two doorways. Depending where you stand, both of these grayscale paintings are visible at the same time. Cinema No. 2 hangs on a wall directly behind Cinema (Paris) with slightly less contrast, feeling like a ghost of the original memory. Although this body of work is extremely personal, it isn't narcissistic. Instead, Ennis encourages viewers to enter into his memories, as themselves, to form their own interpretations, and remember their own stories. 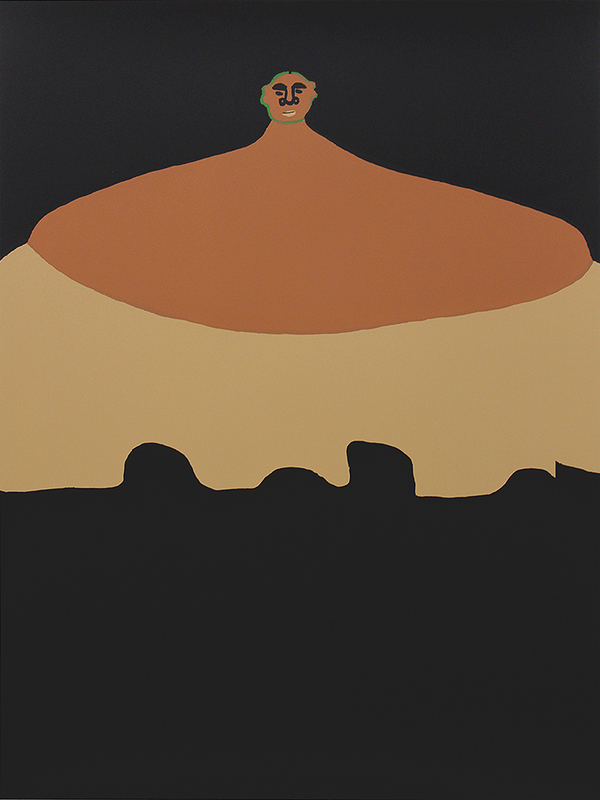 With these works, he seems to have relinquished personal ego in favor of a common experience. 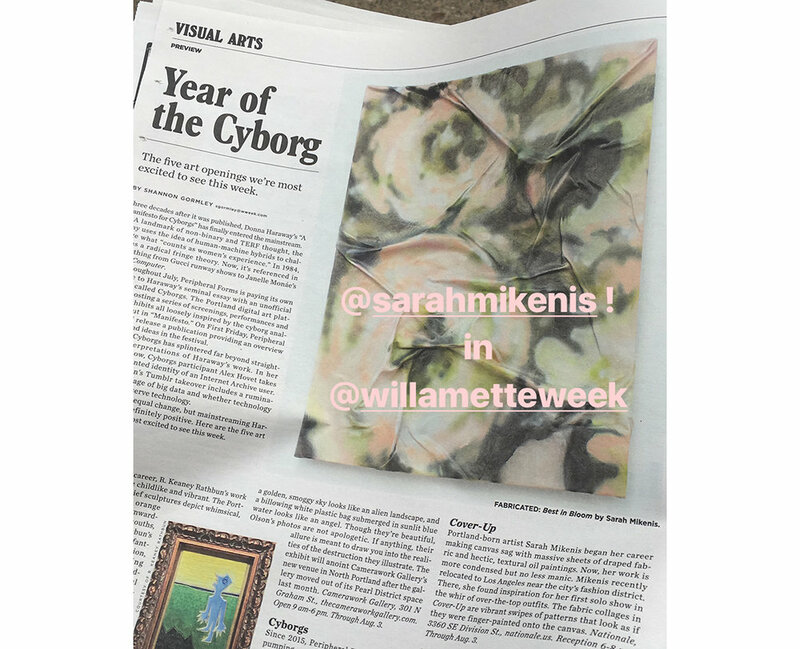 We were thrilled to see our current exhibition by Sarah Mikenis in print this week in The Willamette Week (The Five Art Openings We're Most Excited to See This Week, Shannon Gormley, July 4). 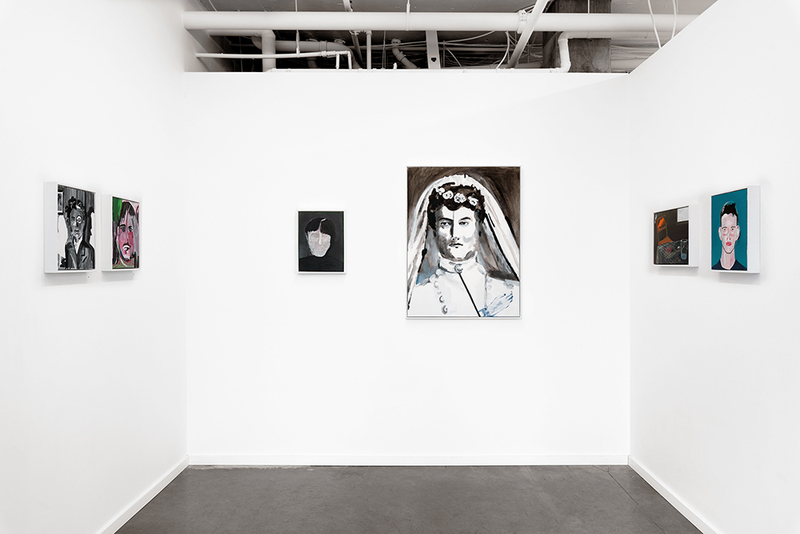 The show was also featured on Juxtapoz Magazine, Oregon ArtsWatch, and in The Oregonian. On view through August 3, 2018. Face Vase (Fem. ), 2017, glaze on clay, 18 x 19 x 9"
Face Vase (Masc. ), 2017, glaze on clay, 14.5 x 10.5 x 8"
Intimacy Vase, 2017, glaze on clay, 11 x 3.5 x 3.5"
Penetration Vase (Mask), 2017, glaze on clay, 4.5 x 4.5 x 5"
Rock Head Vase, 2017, glaze on clay, 6.5 x 6 x 6"
Two Face Vase, 2017, glaze on clay, 7.5 x 6.5 x 5"
Humanoid Table, 2017, glaze on clay and acrylic on wood, 31.5 x 11.5 x 47"
From the gallery desk, Nick Norman’s carved wood sculpture Humanoid Table appears to be just a thin, bright pink neck and bulbous head floating in space. The sculpture’s face emerges from the nothingness—red snakelike tongue slithering out, green ceramic eyes, and ears like chunks of molded shiny pink bubble gum. Each month this seat forces a frame around the work on view, obscuring the majority and focusing on only a fragment. Humanoid Table, like many pieces that have occupied this view in the past, has become that prized visitor who keeps the gallery sitters company. It offers a place for our eyes to wander and find respite from the computer screen, but it also only lets us in on part of the story. The sculpture takes on new life and meaning when seen in its entirety. No longer just a detached neck and head, Humanoid Table, is exactly that, a table. In fact the only human quality to the piece is the head and neck—the legs have no feet, and the table top is a flat slab. These attributes also make it a very functional object; for this exhibition it’s used to display two small ceramic sculptures also by Norman. Although Humanoid Table is far from human, it does illicit issues surrounding labor and oppression. This is in contrast to Norman's other humanoid sculptures which function as vessels—vases don't imply the same exertion of energy in the way tables do. What would it mean to use this table in your life, to bring it home and eat off of it, or place heavy objects on its back while the eyes stare out blankly? The human quality of Humanoid Table is perhaps most present when we see it as a piece of furniture working hard for its human owners. Installation view of Humanoid Table in Animal Laughter. Paintings by William Matheson. LAST DAY TO STAMP ART PASSPORTS! well-loved passports ready to be submitted for a chance to win $1600 to spend on ART! Today is the LAST DAY to get your Art Passport PDX stamped and turned in to one of the eight participating galleries for your chance to win $1600 to spend on art! We've had such a wonderful time being a part of this innovative program developed by the amazing Jennifer Rabin. Thank you to everyone who has come through our door and engaged in thoughtful and inspiring conversations about art! We look forward to congratulating the big winner!